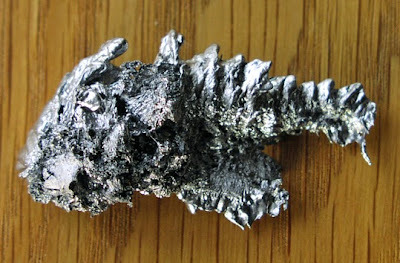 At a party last December 31 I tried out a Finnish New Year's Eve tradition - fortune-telling with melted lead. The Finnish girl who knew what to do had brought along all the equipment - a lump of lead, a little metal pan to melt it in and a bowl to fill with cold water. Everyone took it in turn to tip a little melted lead into the water. The shape it solidified into indicated what they could expect in the year to come. I photographed my lead shape, which you can see in the picture above. I think it looks a bit like a fish. The art of divination using molten lead is called molybdomancy. It is a very old form of divination and was invented in ancient Greece. I was delighted to learn that it is still a common practise today, particularly in Finland and other Nordic countries. When tin is used, the technique is usually called “Uuden Vuoden Tina” or “Casting of the Tin”. If you don't have any lead or tin, you can do a similar type of divination using melted candle wax dripped into water instead. At the party we interpreted the lead shapes simply by what they represented to us, although they can also be interpreted symbolically - in much the same way as the shapes in tea-cup reading. You can also hold the shapes up in a candlelight and rotate them to create shadows to interpret. I know that in tea-cup reading a fish is a symbol of good luck. Looking back I think 2015 was lucky for me. I hope 2016 is too - but I don't know if I will get the chance to have another go at molybdomancy.